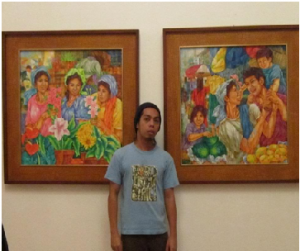 A Filipino Artist born in Angeles City, Pampanga in 1981. Eliseo Perreras is a self-taught painter whose works are mostly depicts the serenity of the Philippine’s rural life, harvest and market scenes. He started painting Still Life with Realism, then Impressionism until he began to develop Transparent Cubism form which he currently focuses using Oil and Acrylic. At present, Eliseo Perreras is an active member of the (AAP) Art Association of the Philippines in Pampanga, also a member of the Kapampangan Artists and had participated and contributed in the recently concluded (PVAF) Philippine Visual Arts Festival – “The Rizal Experience” which had been held at the Municipality of Angono, province of Rizal in February 2012. Eliseo Perreras is internally driven, and emotionally charged self-taught painter. Inspired by the serenity of the Philippine’s rural life, harvest and market scenes. He started painting Still Life with Realism and Impressionism until he began to develop Transparent Cubism form which he currently focuses using Oil and Acrylic.